Thrilled to announce our next high-vibe, deep-dive workshop, taking place online this Saturday, the 27th of April. This month, we’ll be connecting with the element of water and the mermaids to transform subconscious blocks, fears, addictions and shadows into renewed energy and light. We’ll be releasing these from our reality and also from the collective consciousness. This is the perfect ascension class to join if you feel stuck in your life, have limiting habits, beliefs and behaviours to release, and are ready to raise your vibration and live in greater ease. ღ Opening ceremony to set your intentions for positive change as we gather with the Elohim angels, mermaids and unicorns who’ll be channelling their wisdom throughout the class. ღ Support in breaking the limiting thinking, beliefs, behaviours and patterns that have been causing you to feel anxious, depressed, angry or helpless in yourself and in life. ღ Channelled Divine Alchemy process to ascend your being into an anchored state of 5D consciousness. ღ Direct teachings and tools to accelerate your life and soul’s path. ღ Plus, your questions answered live. In case you can’t attend live, you’ll have access to the replay for three weeks, after which time you can purchase the recorded video. After checkout, you’ll be emailed a PDF ticket to the event, which includes an invite to join the event’s Facebook group page to meet and share with everyone taking part. This group is where the event will be live streamed, too. Please bring a pen and journal to take any relevant notes, lots of water to drink to keep hydrated and anything you’d like empowered with the high-vibrational energies we’ll be connecting with. Workshop Date: 27th of April 2019. 7pm – 9pm. Workshop Venue: Online Live stream via a private Facebook group. After check out you’ll receive an email confirmation with an attached PDF as your ticket receipt. Within this document will be the link to join the Facebook group. Please make sure you’ve requested to join the group before the event runs on the 27th of April. Angel Healing® is a heart-based healing modality that brings us into direct communication with the Angels and our own Angelic Presence. The system was brought forward in 2009 through Calista under guidance from Archangel Raphael and Archeia Virtue – the angel of truth and healing. Combing health and empowerment techniques from the angelic realms, this beautiful course opens the door to knowing your divinity and living its grace every day. Angel Healing® is the legal registered form of angel therapy in the UK, and is growing worldwide with certified teachers now in the UK and USA. It is the only angelic system that brings in, and directly attunes practitioners, to both the Archangels and the Archeia (female Archangels) to support your ascension in the current Aquarian Age. For the first time, the Level 3 Angel Healing® Teacher course comes to Calista’s home in Blairgowrie, Scotland and invites all Level 2 Angel Healing® Practitioners (with a minimum of six months practice) to join for 3-days of angelic bliss! Archangel Raphael and Archeia Virtue will be gifting everyone attending their powerful heart-activation to help you embody fully your Angelic Presence while helping your personal path of ascension. This activation supports us to live fully (and in every moment) as our Higher Self. It will increase your angelic relationships 100 fold. The Teacher Training Manual, on-going support and teacher certification upon completion of your case studies. This course will enable you to teach both Level 1 and Level 2 Angel Healing® courses, providing you with a steady income through your divine service. Refreshments and snacks will be provided on the course days. There are plenty of local cafes and sandwich shops for lunches, too. Blairgowrie has many affordable B&Bs, Air B&Bs and hotels. If you’d like to share a room or car share your travel, get in touch with Calista who can put you in contact with other participants – email to CalistaAscension@gmail.com. Your Level 1 and Level 2 Angel Healing® manuals with you, a pen and journal to take notes and anything you’d like empowered with Angelic Light as we’ll be creating a healing angelic altar on the first day. (Please wear white or lightly-coloured clothes during the course days). Retreat Dates and Location: October 4th, 5th and 6th, 10.00am – 5.00pm. Residential location of Ashburn House, James Street, Blairgowrie, Perthshire, Scotland. PH10 6EZ. There is free car parking space available. If you would like to spread the cost over instalments please select to pay just the course deposit of £100 and contact Calista to set up a payment plan. 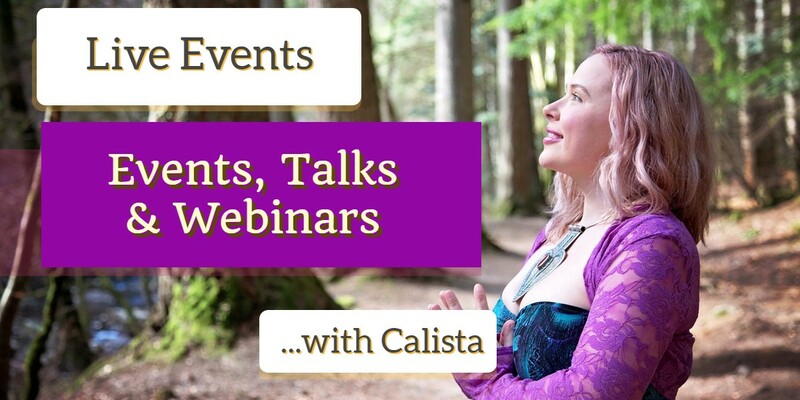 Calista continues her popular ascension-based workshops this time focusing on empowering our cosmic ancestral lineage. We’ll be picking up from where we left off in vibration from last month’s earthly ancestral healing event, ‘Releasing Limitation’, which can be purchased as a replay recording if you couldn’t make the event live. These events are truly life-transforming and will take you as deep as you’re ready for. The space is held by the Elohim, the council of 12 Creator Angels that Calista works with and the Light of the Unicorns. ღ Opening Ceremony to connect us with the Elohim and the Unicorns. ღ Cosmic ancestral healing and soul retrieval to reclaim the parts of you that feel lost or removed through your many lifetimes. ღ Conscious connection / re-connection with your monad (soul group), the Council(s) of Light you may be part of, and your main star / celestial home of origin – and why being aware of these aspects of your multi-Self is important. ღ Direct teachings and tools to accelerate your ascension. ღ Video replay of the workshop in high quality MP4 format that you can download from the DropBox link sent to you after checkout. As this workshop has already taken place you can enjoy the video recording and repeat the activations and attunements within it again and again. After checkout you’ll receive a PDF receipt of purchase and within will the DropBox link to watch and download the workshop. Please bring a pen and journal to take any relevant notes, something to drink to keep hydrated and anything you’d like empowered with the high-vibrational energies we’ll be connecting with. Following the success of the last ascension workshop, Calista gathered with the Creator Angels, the Elohim, to host another transformational event. This 2-hour magical will connect you with your ancestors, not only to honour them and commune with them, but also to dissolve the limiting patterns from your earthly lineage to re-establish and re-create a healthier, more abundant life for you. Expect profound shifts with this, especially if you repeat the meditation process shared. ღ Opening Ceremony to connect with the Light of this new 7-year cycle of ascension. ღ Deep ancestral healing to identify the limitations (shadows, conditionings and feminine / masculine wounds) within your consciousness and the means to clear these on all levels of your being. ღ Creation of a new timeline, which honours your soul’s path so you can fully live your truth now. Please bring a pen and journal to take any relevant notes, something to drink to keep hydrated and anything you’d like empowered with the high-vibrational energies you’ll be connecting with. This 2-hour magical immersion will accelerate your path to ascension and align you to the transforming Light of the Unicorns. Learn who these Divine beings are and how they can help you to re-establish Magic in your life and in the world. Enjoy their practical ways to live fully your path, power and purpose while creating the extraordinary life you deserve. Expect your overall frequency to raise through the attunement process shared, and even more so if you continue to use your etheric unicorn horns in your intuitive and spiritual practices. ღ Opening Ceremony to connect with the Light of the Unicorns. ღ Meeting and attuning from the Elemental Unicorns, as well as other cosmic and nature-based allies who’re ready to connect with you, and why partnering with such luminaries is so important. ღ Receiving of your etheric unicorn horns to clear once and for all the blocks that have been hindering you from living your unique soul’s unique calling. Plus, how to give and receive Unicorn Healing® and entry into the certified program.